Amazon has announced that its LOVEFiLM Instant app is now available for free download on the Xbox One Marketplace. New owners of Microsoft's next-gen console will be able to access the LOVEFiLM app along with rival streaming service Netflix from day one. The LOVEFiLM Instant app features all of the service's most popular features including 1080p high definition streaming, Dolby Digital Plus (5.1) surround sound and the Watchlist feature - allowing users to mark titles in the catalogue to stream at a later date. Whispersync technology is also featured making pause and resume viewing a breeze on any of your media devices. The app will support a variety of new Xbox One features including the 'Snap' and 'fill' modes that allows users to view content from a side panel on the screen whilst simultaneously navigating other menus, games or apps. 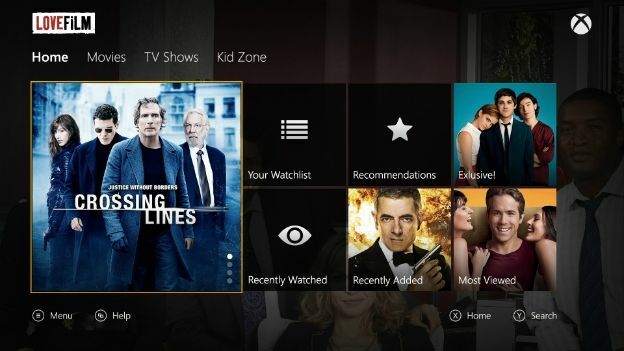 The Xbox One's Kinect motion sensor will also enhance the app's viewing experience by allowing users to entirely navigate around the LOVEFiLM Instant catalogue with the wave of a hand along with supported voice command to easily pick and play a title without using the controller. LOVEFiLM members can also earn badges and achievements on their Xbox One by fulfilling actions such as adding titles to their WatchList or watching new releases. Simon Morris, Chief Marketing Office, at LOVEFiLM said: "The next generation of videogame consoles is a fantastically exciting prospect for LOVEFiLM members in the UK, as accessing and discovering quality content will be easier and even more intuitive than ever before."